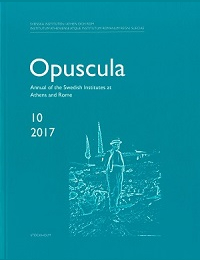 Opuscula is a refereed periodical, published in colour and available in print and in electronic format six months after publication. The annual welcomes contributions pertaining to the ancient Mediterranean world (prehistory to Late Antiquity) and the Classical tradition and drawing on archaeological, historical and philological studies; contributions dealing with later periods in the areas, especially in the fields of art, architecture, history and cultural heritage are also welcome. The bibliographical abbreviation for Opuscula is OpAthRom. Deadline for submissions to Opuscula is 1 November each year. All authors should consult ECSI Guides for Contributors (see Author resources) before submitting their manuscripts. Manuscript are submitted to the Secretary of the Editorial board (see Contact). 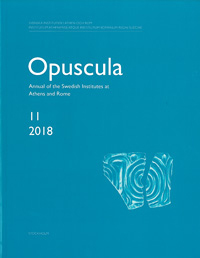 Newly published byThe Editorial Committee of the Swedish Institutes at Athens and Rome (ECSI): Annual of the Swedish Institutes at Athens and Rome, vol. 10, 2017.